Planning a birthday party for your little one? Between work, making lunches every day, shuttling everyone to ballet and soccer, you might not know where to start! Here’s an easy ten-step checklist of things you’ll need for your child’s birthday party. A theme: Let your child choose her favorite theme. Whether she’s into a specific character, like Dora the Explorer, or is enthusiastic about a more general theme, like dinosaurs or pirates, let her guide the way. A venue: You may choose a fun venue like a farm, bowling alley or ice cream parlor, or you can choose to have the party in the comfort of your own home (especially if it has a backyard for the kids to play). A time and date: Make sure key guests, like your child’s best friends, can attend before setting a date. Invitations: Online services like Paperless Post will let you design your own invitations while being kind to the environment. Entertainment: Ask your child what she would prefer –a magician or a balloon artist, perhaps? Make sure you book well in advance to avoid disappointment. Party favors: Fill gift bags with fun trinkets all kids will love, like bubble wands. Decorations: Decorate with colorful balloons, as well as cardboard cutouts and other decorations that fit your party’s theme. Munchies: Plan your menu about three weeks in advance, and fill it with kid-friendly favorites like pizza and hot dogs. Don’t forget to order or bake a cake! Drinks: The kids will enjoy punch made with fresh juices, which could also go into a signature cocktail for the adults. Games and activities: Fun activities like pony rides, bounce houses and face painting are all available through New Joy Entertainment. 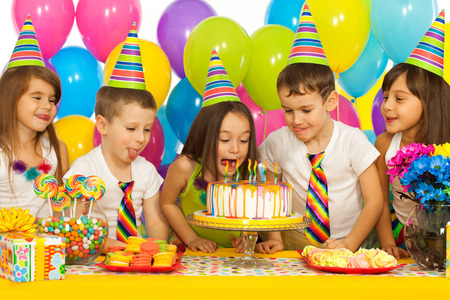 Give us a call today at 908-376-9375 to find out more about how we can make your child’s birthday a day to remember!